It seemed like an excellent idea in the beginning. Using ladybugs as a form of non-toxic, hypoallergenic, affordable pest control for growing fruits and vegetables … what could possibly go wrong? Well, as it turned out, a number of unforeseen problems developed. Here’s an update on the results of experimenting with ladybugs as a form of natural pest control. The ladybug is actually a type of small beetle (typically 1-10 mm in length), and in fact it is known as “lady beetle” by scientists and “ladybird” in the United Kingdom. Found across a wide variety of habitats, there are 5000 species of ladybug, or Coccinellidae in Latin, which typically are spotted with black on a contrasting background of bright red, orange, or yellow. Ladybugs lay hundreds of eggs at a time; several weeks later, these hatch into very active and hungry larvae. This is where the colorful beetle’s perceived value to agricultural operations lies. 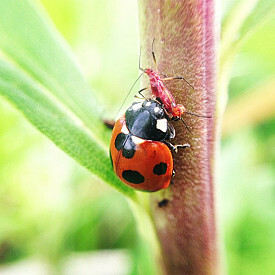 There are several ways to harness “ladybug power” for agricultural pest control. You can start by eliminating the use of pesticides or insecticides and planting flowers whose pollen ladybugs enjoy, to attract these insects to the site where pest control is needed. Add some ladybug houses and drinking water to welcome your distinguished guests. Alternatively, in the spring when ladybugs swarm, you may gently pick them up and place them in a ventilated container for transportation to the spot where their pest-eating talents are needed. As a third option, imported ladybirds may be purchased in bulk from a commercial supplier and then released on site. Importing and releasing ladybugs would seem to be an effective, reasonably priced means of pest control, in theory. Unfortunately the practice comes with a number of drawbacks. The first is that there is no reliable way to keep the beetles, once released, in the area of your garden or orchard. They frequently venture to neighbors’ property or attempt to head back to their home. (A frequent suggestion for managing purchased ladybugs is to stick their wings closed with a sugary soda-pop-and-water solution, to temporarily prevent them flying away; however, this seems cruel.) Second, the imported insects tend to bring parasites and diseases along with them to their new neighborhoods, which then infest native species of ladybugs. Third, ladybugs of the genus Harmonia axyridis have become bothersome in certain regions, when they get into homes and other buildings in search of a place to overwinter. Although not dangerous, they are a nuisance in large numbers, especially because they emit an unpleasantly acrid odor and secrete a bright yellow fluid, which can stain furniture and other household items.